Amusingly enough, today's pumpkin carving was not the only house milestone of the evening. Today shall also go down in history as the day Abby scaled the kitchen cabinets (while mom watched, since her nonchalant demeanor suggests this may not be the first time). You see, the cabinets sit over the fridge. And the fridge sits next to the microwave. The microwave sits on a counter. And the counter is within kitty jumping range of the floor. 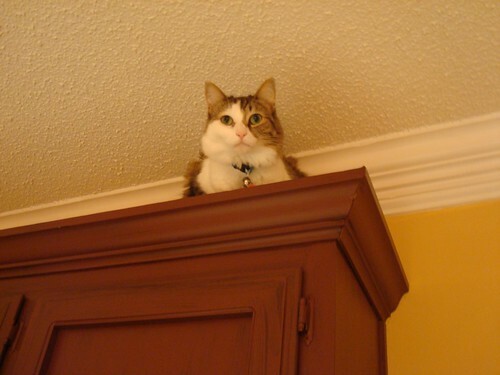 I left her up there for as long as she wanted to stay. I figured if she had gotten up, she could get down. And me trying to shoo her down was probably going to be the death of both of us. On the bright side, it's a free dusting service!